Are you thinking about getting a dog? A Doodle Puppy might be what you’re looking for. Whether you are looking for a companion for yourself or a trustworthy family dog, a poodle mix is definitely the way to go. For some time now, the standard poodle crossbreeds have been growing in popularity. If you ask us, they’re the best dog for any family or lifestyle. 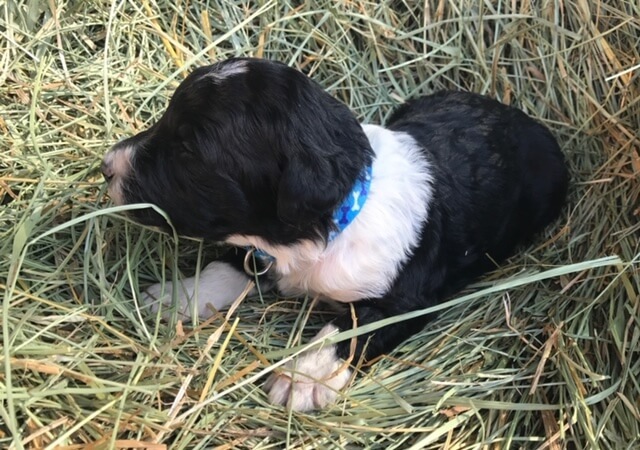 Button is a black and white male Bordoodle puppy. He will be ready to go to his forever home March 3rd. Call us today for more information. Rusty is a brown and white male Bordoodle puppy. He will be ready to go to his forever home April 25th. Call us today for more information. 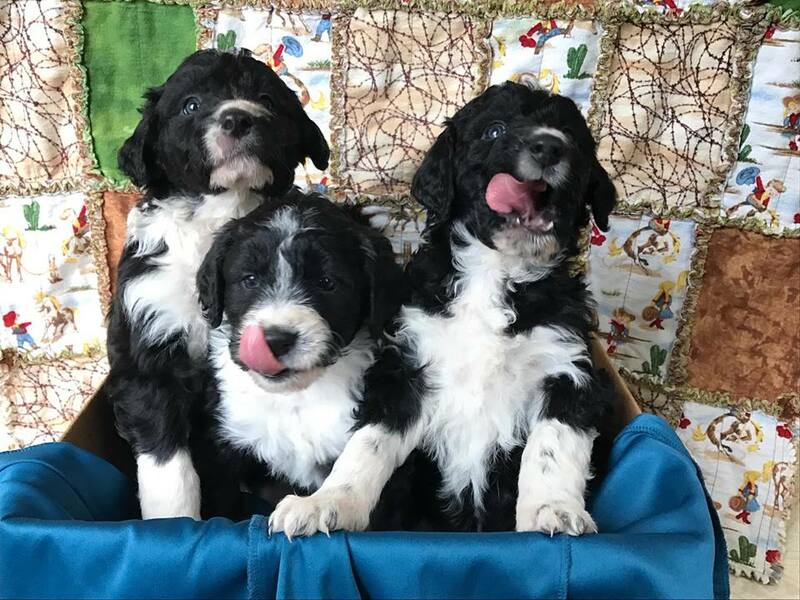 Molly is a black and white female Bordoodle puppy. She will be ready to go to her forever home April 25th. Call us today for more information. 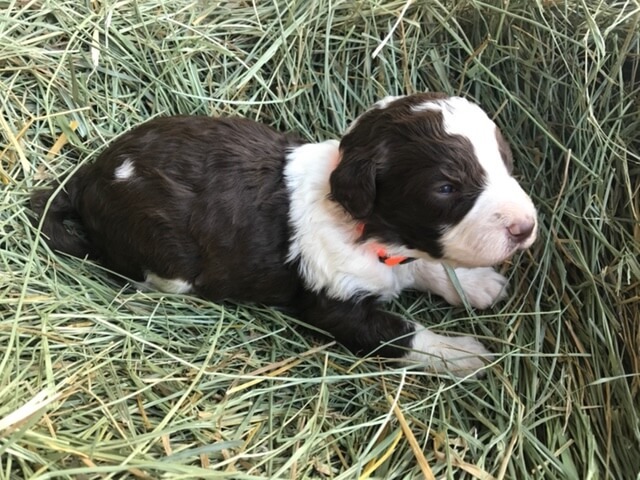 Cocoa is a brown and white female Bordoodle puppy. She will be ready to go to her forever home April 25th. Call us today for more information. 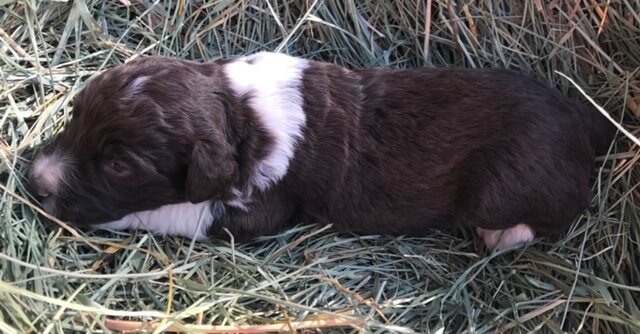 Tootsie Roll is a brown and white female Bordoodle puppy. She will be ready to go to her forever home April 25th. Call us today for more information. Why are poodle mixes such an amazing breed? One of the many positive outcomes of a cross is that they tend to have stronger genetics than the pure breed parents. Poodles are considered by most to be the second smartest dog. This is one of the top reasons why poodles are the go-to breed to mix with other breeds. When deciding whether or not getting a big dog is the right thing to do, most often it’s the excessive shedding commonly seen in big breeds that cause most to say no. Fortunately poodle’s lack an undercoat that causes excessive shedding. The low shedding traits of a poodle is passed on in their genitics. Another remarkable trait that is typically inherited is very low allergenic properties in the fur. 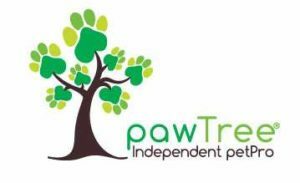 This, alongside the low shedding, makes them a great choice for adults and children with an allergy problem. Your standard poodle is a good family dog. They are smart, gentle and very good with children. This too is passed down. Meet the fur babies from our most recent litters! The crossbreed we currently work with is the mix between a Border Collie and a Standard Poodle known as a Bordoodle. The two breeds are considered the two most intelligent dogs in the world. They both have a lot of the same great qualities. The only bad quality that is in the Border Collie is the excessive shedding. But by crossbreeding the two, it blends all the good traits and gets rid of the bad ones. Check out the mother and father below.